'What you build' is an application for a city program in St. Louis, MO. 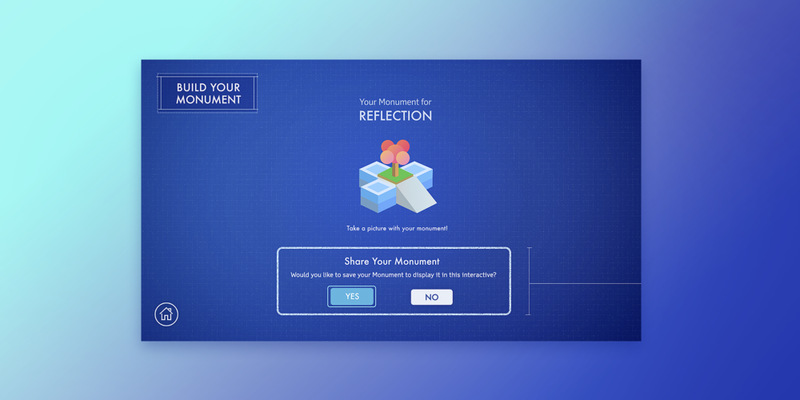 Inspired by the Gateway Arch, this application provides visitors a playful experience to design their own monument with an easy pick-up process and appealing visual elements. After talking through our preliminary idea with the client, we made a new iteration based on client's feedback. During this phase, we were working on making the interaction loop/ hierarchy more clear and consistent while adding more interactive elements for visitors to enrich their experience. 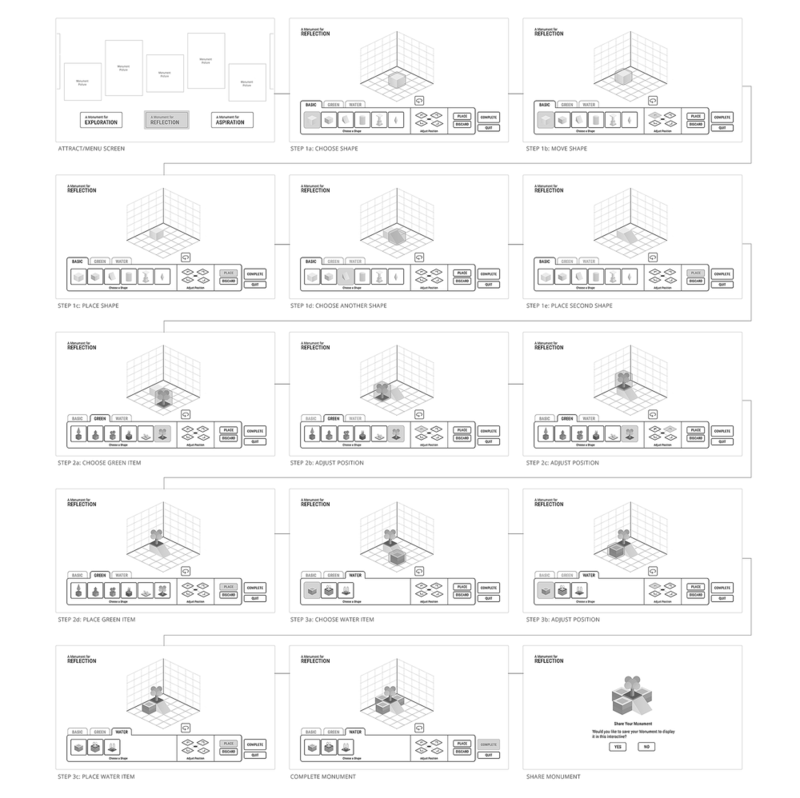 Architectural, Planning, Sketchy lines, Clean colors - old-school blueprint is the first thing came to my mind when we started to think about the visual approach for this application. We strived to have something clear, simple but still visually appealing. 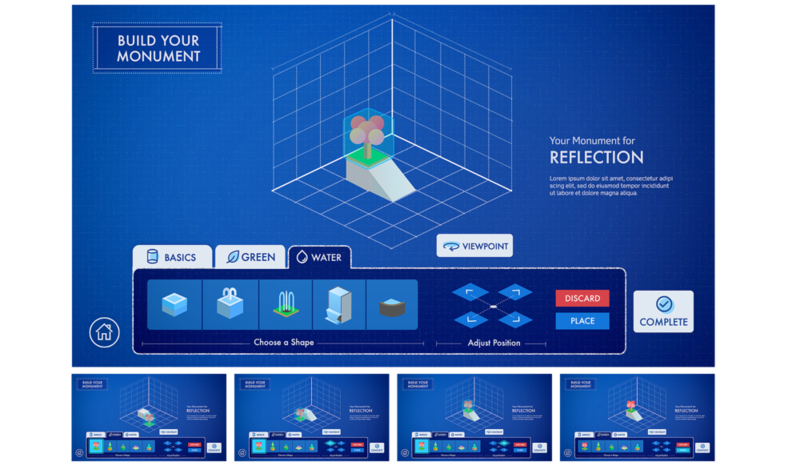 The blueprint style not only builds a consistent visual connection between the elements and behaviors but also reinforce the context of 'design your own monument'. We also refined the use of ADA Keypad, simplified the interaction flow and levels to make it easier to be used for this application. A blind visitor can also play the application by pressing the keypad’s help button while on the Start Screen allows users to change their settings for volume, speed, and voice. If the keypad is used while the program is on the Start Screen, when the visitor proceeds, they will receive a general interstitial explanation of how the keypad will work throughout the program.